Traditional Jews believe that the Chumash (Hebrew for the Five Books of Moses), was presented by God to the prophet Moses on Mount Sinai. Over the ensuing centuries after Moses, this vast body of knowledge was faithfully passed from teachers to students. Those students then became teachers who passed the knowledge on to the next generation and so on. During the period roughly between 200 and 500 of the Common Era, this oral explanation of the Bible was written and recorded for posterity. The Babylonian Talmud is by far the most famous and widely studied of these works. Several other parallel works were also written, which, for simplicity’s sake, this volume refers to as talmudic writings. All have since been interpreted and clarified by several major classical commentators. Centuries of talmudic scholars have accepted that these commentaries define the true meaning of the Talmud, and hence, the Oral Tradition from Mount Sinai. The Talmud deals with many different topics such as the laws of commerce, marriage and Jewish religious ritual. It also deals extensively with humanitarian issues. The classical Bible stories, such as those of Adam and Eve and Joseph and his brothers, are explained by the Talmud in a manner that gives them eternal relevance. Although these incidents took place in ancient times, basic human nature never changes. The psychodynamics of humility and arrogance, alacrity and laziness, generosity and greed, happiness and sadness, sound and unsound economics, belief in God and apostasy, and so forth, are the same now as they were thousands of years ago. 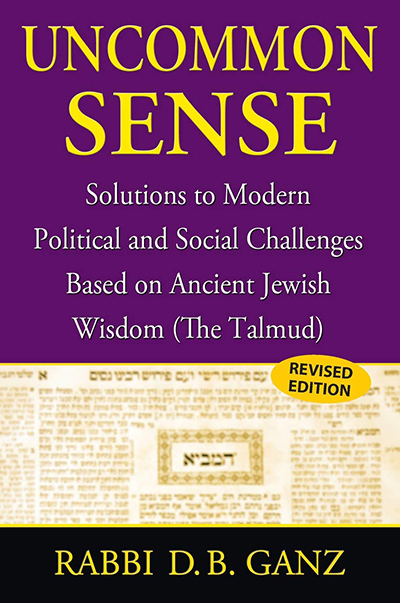 Traditional Judaism therefore views the Talmud as an up to date guide to human psychodynamics and ethics. It reveals the profundities of man and it illustrates how people of all ages should, or should not, act. In a similar vein, although not Divine, the world’s great secular literary classics remain relevant centuries after they were written; they deal with core human issues that simply never change. The chapters in this volume focus on the issues that bedevil modern society. They present ancient talmudic concepts and demonstrate their contemporary relevance and application. Talmudic wisdom is neither Liberal nor Conservative. When applied to social issues, it does indeed often take strong positions. Yet, surprisingly often, it explains why this is not a choice between two valid alternatives. Rather, one approach to the issue is correct, and the other is clearly mistaken. Furthermore, it often shows how following a misguided policy will cause more harm than good.